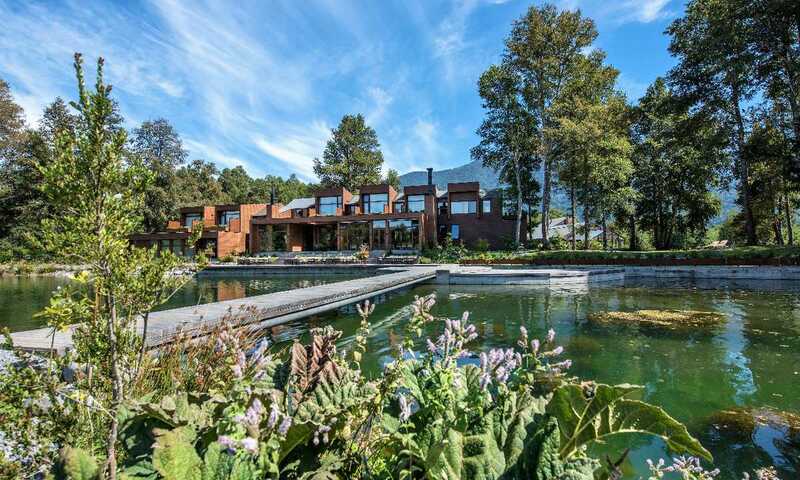 Sitting in 55 acres of its own land under the shadow of the smouldering Villarica Volcano, and with almost 1km of the Liucura River winding through its gardens, the Hotel Vira Vira has a pretty unrivalled setting in the area. By day you can hike, bike and kayak through the verdant temperate rainforest, past cascading waterfalls and snowcapped peaks. By night, enjoy a delicious dinner of home-grown foods carefully paired with exquisite Chilean wines. The setting allows immediate access to the 'great outdoors' for all abilities; summit active volcanoes or take a leisurely stroll through beautiful rainforest to waterfalls and lakes, float along the tranquil Liucura River or raft the mighty rapids of the Trancura River, there really is something for everyone. The hotel itself is built of native Lenga tree, a warm sandy wood. With woollen throws and private terraces, the hotel is the perfect place to sit back and relax with a book, coffee or glass of wine in hand. Hotel Vira Vira sits nestled between two National Parks, a private reserve, waterfalls, rivers, and lakes. On arrival, you will receive a welcome briefing from one of the hotel's experienced guides. They will talk you through the area, find out about your experience and what you're hoping to do, and then set up a programme for you once you've talked through all the possible excursions options that would suit you. For the more adventurous, you can get your crampons on and hike to the summit of the active Villarrica Volcano, mountain bike some downhill single track or raft grade III rapids on the Trancura River. For a more leisurely experience, you can float down the Liucura River straight from the hotel's front door, fly fish, take a 1/2 day hike to volcanic caves or waterfalls. The area is also surrounded by thermal pools which are great for soaking weary legs after a hard day's hike. In 2017, the hotel added Heli Tours to its excursion offering, which can fly you over the crater of the smoking volcano. The hotel produces nine different types of cheese from a dairy on site. Further to this, the four greenhouses, numerous allotments, roaming chickens and many other animals allow for a true "farm-to-table" menu. As a result, the food is creative, wholesome, tasty and continually changing, with no tw0 days the same. Each course is paired with one of the 3,000 wines stored in the cellars. The hotel has a wood burning hot tubs dotted around its property on the shores of the lake, and in secluded spots around the grounds. They also have a newly built spa area where they offer a full range of massage therapies. Hotel Vira Vira is located very close to the lakeside town of Pucon in the northern part of the Chilean Lake District, an easy flight and transfer from Santiago (2.5 hours total travel time). With the Liucura River snaking its way through the beautiful garden of the hotel, and mountain peaks in the distance thickly forested with virgin forest, the setting really is idyllic. At night you can see the red glow of the active Villarrica Volcano, and by day kingfishers perch on branches down by the river. With so much to see and do in the area, we would highly recommend a 3-4 night minimum stay to ensure you see the full variety of scenery. It is also worth making time to soak in the riverside wood-fueled hot tubs and enjoying some of the local indigenous Mapuche cultures of Pucon and the surrounding area. A four-night double occupancy stay in the Hotel Room category starts at $2,740 USD per person in the 2018/19 season. The rate includes all meals carefully prepared with ingredients from their farm (breakfast, lunch and dinner), all beverages including a wide selection of Chilean wines (except premium wines and liquors), excursions and activities (except flight around the volcano and ascension to the Volcano) and transfers from and to Temuco Airport (or transfer to San Martin de Los Andes if staying 3 nights or longer). There is no minimum night stay. One night half board in the Hotel Room category starts from $525 USD per double room per night. There are 12 Villa Suites that line the shores of the meandering Liucura River, these are the most luxurious of the rooms at the hotel. Each room is split level with its own living room, individual fireplace, terrace and outdoor hot tub, perfect for clear starry skies. The rooms are just a short walk from the main hotel building making them very private, quiet and totally at one with nature. There are 6 rooms within the main building of the hotel, slightly smaller than the Villa Suites but still very spacious. Each room has a private balcony with either an elevated view of the river or the hotel's park/farmland. These rooms are great if you are slightly less active or don't fancy the short walk through the hotel park to reach the outside rooms. Originally built as the owner's home with room for 10 guests, this house can be reserved as one unit, ideal for a family or a group of friends. Although a short walk from the main hotel building, the Owners Lodge comes with 5 ensuite rooms, an open living and dining room, a comfortable lounge, a covered balcony and a garden terrace. Meals would be served either in the main hotel or in your own private lodge, the choice is yours.